The REVOLUTION® Floor Flood Feeder offers the management simplicity of flood windows along with the feed conversion advantages and greater bird comfort offered by the entire REVOLUTION® Feeder Family. 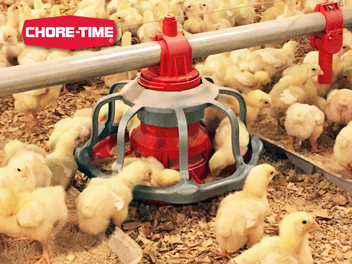 Chore-Time’s E-Z START® Feeder provides a high level of feed to get birds off to a good start. Inset photo shows how the E-Z START Feeder stows neatly beside the feeder line during grow out, where is does not obstruct access to the grow-out feeding system. MILFORD, Indiana, U.S.A. — Chore-Time has reinvented its E-Z START® Feeder with new outlet drop tubes that stow completely out of the way when not in use. This innovation helps get birds off to a good start and maximizes productivity by allowing growing birds unobstructed access to all angles of the grow-out feeding system. It also simplifies assembly and repair, since the new drop tubes contain just two parts that snap together without tools or hardware. 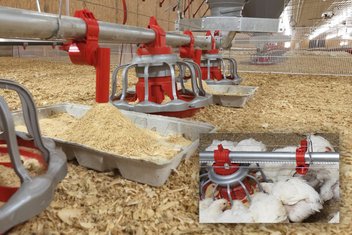 During grow-out, the E-Z START Feeder outlet drop tubes not only stow neatly beside the feeder line, but they also allow trash, such as dust and feathers, to fall through the feeder’s open tubes to the litter below preventing buildup of contamination that would impact the next brood cycle. When rotated down into the open position during brood, the feeder fills chick trays, poult pans or paper with a high level of feed to help get birds off to a quick start. Other features of the E-Z START Feeder include an internal tab for locking the feeder in place. Additionally, a spout attachment to the tube connector includes snap points that lock the spout into the up or down position. The feeder is made of durable, polypropylene plastic with ultraviolet protection for long life. It offers easy operation, management, cleaning and storage. Options include telescoping brood cones and extension tubes, as well as poult pans.